You are here: Home » Uncategorized » Sword Raffle! This sword could be yours! We’ll be drawing for the winner on June 1, 2016! 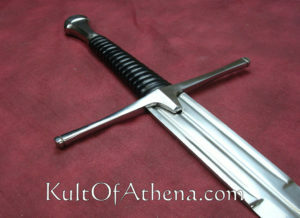 Thanks to the kind sponsorship of Kult of Athena, Veritas Medieval Faire is offering a sword for raffle! The star attraction of many period manuscripts about medieval swordplay, the austere, elegant lines of this fine replica long sword betray what a brutally efficient weapon it is! Weighing just 3 lbs. 3.6 oz., this accurately weighted and detailed 14th Century replica weapon is an imposing 48” long overall, with a double-edged, unsharpened high carbon steel blade of 38”. With a point of balance 6 and 5/16” out from the hilt, this sword simply screams to cut something, while the long, leather covered wood grip and steel pommel ensure admirable balance, a fast recovery and good point control. This is a rugged and ready weapon, not a toy or decoration. For just $5 per entry, this sword could be yours! Every entry also receives a FREE download of “Music of the Middle Ages,” a $9 value, featuring over an hour of music! Drawing will take place on June 1st, 2016; winner will be notified by email. Winner will have 48 hours to respond. Shipping charges, if any, will be paid by winner. Buy your raffle ticket today here, in person at Vertias Medieval Faire on May 28th, 2016 or on the Tickets Page here!